This article is about the mountain. For the eponymous automobile, see GMC Denali. For the surrounding national park, see Denali National Park and Preserve. For other uses, see Denali (disambiguation). Denali ( /dɪˈnɑːli/)   (also known as Mount McKinley, its former official name)  is the highest mountain peak in North America, with a summit elevation of 20,310 feet (6,190 m) above sea level. With a topographic prominence of 20,156 feet (6,144 m) and a topographic isolation of 4,629 miles (7,450 km), Denali is the third most prominent and third most isolated peak on Earth, after Mount Everest and Aconcagua. Located in the Alaska Range in the interior of the U.S. state of Alaska, Denali is the centerpiece of Denali National Park and Preserve. On September 2, 2015, the U.S. Geological Survey announced that the mountain is 20,310 feet (6,190 m) high,  not 20,320 feet (6,194 m), as measured in 1952 using photogrammetry. Denali has two significant summits: the South Summit is the higher one, while the North Summit has an elevation of 19,470 ft (5,934 m)  and a prominence of approximately 1,270 ft (387 m). The North Summit is sometimes counted as a separate peak (see e.g., fourteener) and sometimes not; it is rarely climbed, except by those doing routes on the north side of the massif. Five large glaciers flow off the slopes of the mountain. The Peters Glacier lies on the northwest side of the massif, while the Muldrow Glacier falls from its northeast slopes. Just to the east of the Muldrow, and abutting the eastern side of the massif, is the Traleika Glacier. The Ruth Glacier lies to the southeast of the mountain, and the Kahiltna Glacier leads up to the southwest side of the mountain. With a length of 44 mi (71 km), the Kahiltna Glacier is the longest glacier in the Alaska Range. The first ascent of the main summit of Denali came on June 7, 1913, by a party led by Hudson Stuck and Harry Karstens. 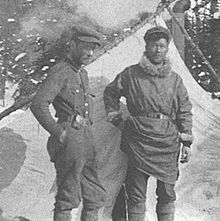 The first man to reach the summit was Walter Harper, an Alaska Native. Robert Tatum also made the summit. Using the mountain's contemporary name, Tatum later commented, "The view from the top of Mount McKinley is like looking out the windows of Heaven!" They ascended the Muldrow Glacier route pioneered by the earlier expeditions, which is still often climbed today. Stuck confirmed, via binoculars, the presence of a large pole near the North Summit; this report confirmed the Sourdough ascent, and today it is widely believed that the Sourdoughs did succeed on the North Summit. However, the pole was never seen before or since, so there is still some doubt. Stuck also discovered that the Parker-Browne party were only about 200 feet (61 m) of elevation short of the true summit when they turned back. The mountain is regularly climbed today. In 2003, around 58% of climbers reached the top. But by 2003, the mountain had claimed the lives of nearly 100 mountaineers over time. The vast majority of climbers use the West Buttress Route, pioneered in 1951 by Bradford Washburn,  after an extensive aerial photographic analysis of the mountain. 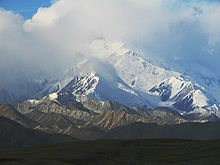 Climbers typically take two to four weeks to ascend Denali. It is one of the Seven Summits; summiting all of them is a challenge for mountaineers. On August 4, 2018, 5 people died in the K2 Aviation de Havilland Beaver (DHC-2) crash near Denali. 1963: A team of six climbers (W. Blesser, P. Lev, R. Newcomb, A. Read, J. Williamson, F. Wright) made the first ascent of the East Buttress. The summit was attained via Thayer Basin and Karstens Ridge. See AAJ 1964. 1972: First descent on skis down the sheer southwest face, by Sylvain Saudan, "Skier of the Impossible". Proclossiana aphirape denali Klots, 1940 is a Boloria butterfly species of the Heliconiinae subfamily of Nymphalidae. Erigeron denalii A. Nelson, 1945 or Denali fleabane is an Erigeron fleabane species. Erebia mackinleyensis (Gunder, 1932) or Mt. McKinley alpine is a butterfly species of the Satyrinae subfamily of Nymphalidae. Uredo mckinleyensis Cummins 1952 or Uredo mackinleyensis Cummins 1952 is a rust fungus species. ^ a b c d Mark Newell; Blaine Horner (September 2, 2015). "New Elevation for Nation's Highest Peak" (Press release). USGS. Retrieved May 16, 2016. ^ Wagner, Mary Jo (November 2015). "Surveying at 20,000 feet". The American Surveyor. 12 (10): 10–19. ISSN 1548-2669. ^ a b "Denali, Alaska". Peakbagger.com. Retrieved December 12, 2015. ^ a b "Denali". Geographic Names Information System. United States Geological Survey. Retrieved January 20, 2010. ^ Jones, Daniel (2003) . Peter Roach; James Hartmann; Jane Setter (eds.). English Pronouncing Dictionary. Cambridge: Cambridge University Press. ISBN 3-12-539683-2. ^ "Denali". Oxford Dictionaries. Retrieved December 17, 2015. ^ a b Mr. Wyden, from the Committee on Energy and Natural Resources (September 10, 2013). "Senate Report 113-93 – Designation of Denali in the State of Alaska". U.S. Government Publishing Office. Retrieved September 16, 2015. 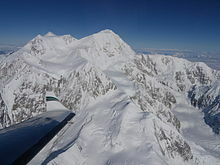 The State of Alaska changed the name of the mountain to Denali in 1975, although the U.S. Board on Geographic Names has continued to use the name Mount McKinley. Today most Alaskans refer to Mount McKinley as Denali. ^ a b "Denali Name Change" (PDF) (Press release). U.S. Department of the Interior. August 28, 2015. Retrieved August 31, 2015. ^ a b Campbell, Jon (August 30, 2015). "Old Name Officially Returns to Nation's Highest Peak". U.S. Board of 6Geographic Names ( U.S. Geological Survey). Retrieved May 16, 2016. ^ a b c Roberts, David (April 2007). "The Geography of Brad Washburn (1910–2007)". National Geographic Adventure. Archived from the original on November 3, 2013. Retrieved 2013-03-04. ^ a b Brease, P. (May 2003). "GEO-FAQS #1 – General Geologic Features" (PDF). National Park Service. Retrieved March 17, 2013. ^ Hanson, Roger A. "Earthquake and Seismic Monitoring in Denali National Park" (PDF). National Park Service. pp. 23–25. Retrieved March 17, 2013. ^ Clark, Liesl (2000). "NOVA Online: Surviving Denali, The Mission". NOVA. Public Broadcasting Corporation. Retrieved June 7, 2007. ^ "Mountains: Highest Points on Earth". National Geographic. Retrieved March 17, 2013. ^ "Mount McKinley-North Peak, Alaska". Peakbagger.com. Retrieved March 18, 2013. ^ "Denali National Park and Preserve". AreaParks.com. Retrieved March 18, 2013. ^ "Denali National Park". PlanetWare. Retrieved March 18, 2013. ^ Martinson, Erica (August 30, 2015). "McKinley no more: America's tallest peak to be renamed Denali". Alaska Dispatch News. Retrieved August 31, 2015. The name "Denali" is derived from the Koyukon name and is based on a verb theme meaning "high" or "tall," according to linguist James Kari of the Alaska Native Language Center at the University of Alaska Fairbanks, in the book "Shem Pete’s Alaska." It doesn't mean "the great one," as is commonly believed, Kari wrote. 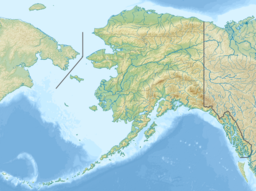 ^ Dictionary of Alaska Place Names (PDF). United States Department of the Interior. 1976. p. 610. ISBN 0944780024. .
^ Norris, Frank. "Crown Jewel of the North: An Administrative History of Denali National Park and Preserve, Vol. 1" (PDF). National Park Service. p. 1. ^ Berton, Pierre (1990) . Klondike: The Last Great Gold Rush 1896–1899 (revised ed.). p. 84. ISBN 0-14-011759-8. OCLC 19392422. ^ Group, United States Dept of the Interior Alaska Planning (October 8, 1974). "Proposed Mt. McKinley National Park Additions, Alaska: Final Environmental Statement". Alaska Planning Group, U.S. Department of the Interior. Retrieved October 8, 2017 – via Google Books. ^ Johnson, Lyndon B. (October 23, 1965). "Statement by the President Designating Two Peaks of Mount McKinley in Honor of Sir Winston Churchill". The American Presidency Project. University of California, Santa Barbara. Retrieved December 29, 2015. ^ Senator Ron Wyden (September 10, 2013). "Senate Report 113-93, Designation of Denali in the State of Alaska". US Government Publishing Office. Retrieved August 31, 2015. ^ Monmonier, Mark (1995). Drawing the Line: Tales of Maps and Cartocontroversy. Henry Holt and Company. p. 67. ISBN 0-8050-2581-2. Retrieved January 22, 2013. ^ Richardson, Jeff (August 30, 2015). "Denali to be restored as name of North America's tallest mountain". Fairbanks Daily News-Miner. Retrieved August 30, 2015. 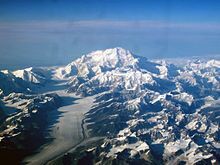 ^ "President Obama OKs renaming of Mount McKinley to Denali". Alaska Dispatch News. August 30, 2015. Retrieved August 30, 2015. ^ "Ohio lawmakers slam Obama plans to rename Mt. McKinley 'Denali' during Alaska trip". Fox News. August 31, 2015. Retrieved August 31, 2015. ^ Glionna, John M. (August 31, 2015). "It's back to Denali, but some McKinley supporters may be in denial". Los Angeles Times. Retrieved August 31, 2015. ^ "Ohio Gov. Kasich opposes changing name of Mount McKinley". KTUU. Associated Press. August 31, 2015. Archived from the original on September 2, 2015. Retrieved August 31, 2015. ^ Martinson, Erica (August 30, 2015). 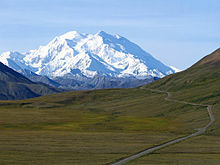 "McKinley no more: North America's tallest peak to be renamed Denali". Alaska Dispatch News. Retrieved September 2, 2015. ^ Kari, James. 1981. Native names celebrate the mountain's grandeur. Now in the North, February. ^ a b Kari, James (2003), Names for Denali/Mt. McKinley in Alaska Native Languages, pp. 211–13. ^ Thiessen, Mark (August 31, 2015). "Renaming Mount McKinley to Denali: 9 questions answered". Associated Press. Retrieved September 2, 2015. ^ Beckey 1993, p. 42. ^ Beckey 1993, p. 44. ^ Beckey 1993, p. 47. ^ Sherwonit, Bill (October 1, 2000). Denali: A Literary Anthology. Seattle: The Mountaineers Books. p. 9. ISBN 0-89886-710-X. See, particularly, chapter 4 (pp. 52–61): "Discoveries in Alaska", 1897, by William A. Dickey. ^ "Denali National Park Quarter". National Park Quarters. Retrieved March 17, 2013. ^ Beckey 1993, p. 139. ^ "North peak of Mount McKinley: A Timely Escape". The American Alpine Club. Archived from the original on September 6, 2015. Retrieved October 5, 2015. ^ Heacox, Kim (2015). Rhythm of the Wild: A Life Inspired by Alaska's Denali National Park. Connecticut: Rowman & Littlefield. pp. 55–56. ISBN 9781493003891. Retrieved October 5, 2015. ^ Coombs & Washburn 1997, p. 26. ^ a b Franz, Derek (June 23, 2017). "Katie Bono sets probable women's speed record on Denali". Alpinist Magazine. Retrieved March 13, 2019. ^ Glickman, Joe (August 24, 2003). "Man Against the Great One". The New York Times. Retrieved September 25, 2010. ^ a b Borneman, Walter R. (2003). Alaska: Saga of a Bold Land. HarperCollins. ISBN 0-06-050306-8. Retrieved February 13, 2013. ^ Stuck, Hudson. The Ascent of Denali. ^ Verschoth, Anita (March 28, 1977). "Mount Mckinley On Cross-country Skis And Other High Old Tales". Sports Illustrated. Retrieved March 18, 2013. ^ Waterman 1998, p. 31. ^ a b c d "Historical Timeline". Denali National Park and Preserve. National Park Service. Retrieved September 25, 2010. ^ MacDonald, Dougald (June 15, 2012). "Remembering Denali's Greatest Rescue". www.climbing.com. ^ "Denali (Mount McKinley)". SummitPost.org. Retrieved March 21, 2013. ^ a b "Cassin Ridge" (PDF). supertopo.com. Retrieved February 16, 2013. ^ "Cassin Ridge" (PDF). Cascadeimages.com. Retrieved October 8, 2017. ^ "We Climbed our Highest Mountain: First ascent McKinley's SE Spur and South Face". Look. Vol. 26 no. 21. October 9, 1962. pp. 60–69. ISSN 0024-6336. ^ Geiger, John (2009). The Third Man Factor. Weinstein Books. p. 109. ISBN 978-1-60286-116-9. Retrieved March 21, 2013. ^ "Climb Mount McKinley, Alaska". National Geographic. Retrieved March 21, 2013. ^ Blomberg, Gregg (1968). "The Winter 1967 Mount McKinley Expedition". American Alpine Club. Retrieved January 11, 2016. ^ Tabor, James M. (2007). Forever on the Mountain: The Truth Behind One of Mountaineering's Most Controversial and Mysterious Disasters. W. W. Norton. ISBN 0-393-06174-4. ^ Babcock, Jeffrey T. (2012). Should I Not Return: The Most Controversial Tragedy in the History of North American Mountaineering!. Publication Consultants. ISBN 978-1-59433-270-8. ^ Beckey 1993, p. 214. ^ Beckey 1993, p. 298. ^ "Exposure, Weather, Climbing Alone — Alaska Mount McKinley". Accident Reports. American Alpine Journal. 5 (2): 25. 1985. Retrieved March 8, 2015. ^ "Mount McKinley, South Face, New Route". Climbs And Expeditions. American Alpine Journal. Golden, Colorado: American Alpine Club. 26 (58): 174. 1985. ISSN 0065-6925. ^ "Denali First Ascents and Interesting Statistics" (PDF). National Park Service. ^ "North America, United States, Alaska, Denali National Park, Denali, Butte Direct". American Alpine Journal. Golden, Colorado: American Alpine Club. 40 (72): 217. 1998. ISSN 0065-6925. ^ Secor 1998, p. 35. ^ a b Rozell, Ned (July 17, 2003). "Mountaineering and Science Meet on Mt. McKinley". Ketchikan, Alaska: Sitnews. Retrieved January 24, 2013. ^ "Japanese install probe on tallest US peak". The Japan Times. July 17, 2006. Archived from the original on November 3, 2013. Retrieved 2013-01-24. ^ Dixon, Joseph S. (1938). Fauna of the National Parks of the United States. Washington, D.C.: National Park Service. Retrieved January 24, 2013. Coombs, Colby; Washburn, Bradford (1997). Denali's West Buttress: A Climber's Guide to Mount McKinley's Classic Route. Seattle: The Mountaineers Books. ISBN 978-0-89886-516-5. Davidson, Art (2004). Minus 148°: First Winter Ascent of Mt. McKinley (7th ed.). The Mountaineers Books. ISBN 0-89886-687-1. Retrieved February 16, 2013. Rodway, George W. (March 2003). "Paul Crews' "Accident on Mount McKinley"—A Commentary". Wilderness and Environmental Medicine. 14 (1): 33–38. doi: 10.1580/1080-6032(2003)014[0033:PCAOMM]2.0.CO;2. ISSN 1080-6032. PMID 12659247. Scoggins, Dow (2004). Discovering Denali: A Complete Reference Guide to Denali National Park and Mount McKinley, Alaska. iUniverse. ISBN 978-0-595-75058-0. Retrieved February 16, 2013. Secor, R. J. (1998). Denali Climbing Guide. Mechanicsburg, Pennsylvania: Stackpole Books. ISBN 0-8117-2717-3. Retrieved February 16, 2013. Stuck, Hudson (1988). The ascent of Denali (Mount McKinley): a narrative of the first complete ascent of the highest peak in North America. Wolfe Publishing Co. ISBN 978-0-935632-69-9. Retrieved February 16, 2013. Waterman, Jonathan; Washburn, Bradford (1988). High Alaska: A Historical Guide to Denali, Mount Foraker, & Mount Hunter. The Mountaineers Books. ISBN 978-0-930410-41-4. Retrieved February 16, 2013. Waterman, Jonathan (1998). In the Shadow of Denali: Life and Death on Alaska's Mt. McKinley. Lyons Press. ISBN 978-1-55821-726-3. Retrieved February 4, 2013. Waterman, Jonathan (1991). Surviving Denali: A Study of Accidents on Mt. McKinley, 1910-1990. The Mountaineers Books. ISBN 978-1-933056-66-1. Retrieved February 16, 2013. Wilson, Rodman; Mills Jr, William J., Jr.; Rogers, Donald R.; Propst, Michael T. (June 1978). "Death on Denali". Western Journal of Medicine. 128 (6): 471–76. LCCN 75642547. OCLC 1799362. PMC 1238183. PMID 664648.